Dolls were more than just a plaything when it came to Native American people. 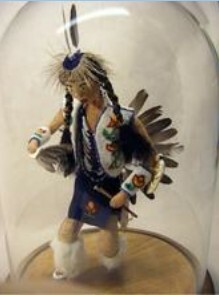 Native Americans are composed of many tribes and almost each of them had their unique culture when it came to creating dolls. Therefore, a doll was never limited to being a toy for a little girl. Given the spiritual legacy of the Native American people, it should come as no surprise that dolls too were endowed with immense amount of spiritual and religious significance. From the materials used to make these dolls to the specific shape and features that they were endowed with - everything had a deeper significance. Dolls were mostly made with a lot of locally available materials and the “design sensibilities” of the tribe as well. For instance, if you were to look at Native American made dolls of the Navajo tribe then you would instantly notice that they are characterized by extremely intricately created jewelry. Whereas the dolls made from the Seminole tribe were created by the use of palmetto leaves. Interestingly, most Native American people made dolls to symbolize a human being. These dolls normally came with a lot of features and a well-defined face as well. But when the dollar was created with no defined facial features, then it was said to represent a spirit and not a human form. A Kachina Doll for instance was more like a wooden statuette which is not really a child’s toy but was meant for religious purposes instead. Experts in Native American culture will be able to distinguish a doll made by one particular tribe from the other very easily. For instance, the dolls that were made by the Inuit tribe were mostly made with fur because they resided in extremely cold weather zones. Shoshone dolls were known by their buckskin and were, interestingly, made out of real life like cradle boards. While vintage Native American dolls are indeed a collector’s item, there are plenty of companies that recreate the beauty of these dolls even today. If you were to look through the various websites of such makers of Native American dolls, then you will be able to appreciate the kind of detail that has gone into making them.